I have to admit — I’m a lazy reader. I prefer books that make me laugh out loud over heavy dystopian books that make me think about the evolution of society. I want books with lots of snappy dialogue and easy-to-swallow plotlines. I wish all my books were light summer reads, even if it’s the dead of winter. It’s like how I constantly crave junk food. Review: Brave Story is a long read, but worth every minute. It’s the sort of book that has such beautiful and detailed language that I just want to bask in the flow of words — you know, that kind of book. The intermingling of Wataru’s real life and fantasy world is gracefully done. Wataru’s adventure can be a bit puzzling at times, but if you just keep reading, it’ll all come together. 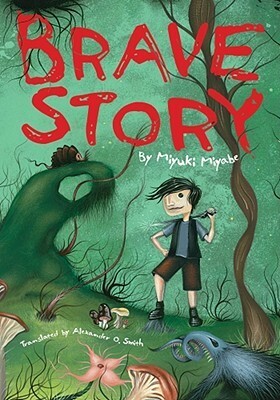 Note: Brave Story is written by Miyuki Miyabe, who is a Japanese author in Japan — not a POC written work from America, England, etc. But a change of pace is nice, isn’t it? I promptly put the book on my wish list. It is a long read (820 pages). But I love a journey story like this.